There is something magical about cannabutter spread on cinnamon rolls. It gives me a feeling I can’t wrap my head around. I just can’t compare the sensation with ones I get from eating other snacks. After eating two rolls, I normally get a good fill and some buzz going. Making these rolls may seem like some work but the payoff is massive. This recipe uses both cannamilk and cannabutter but I will only share the cannabutter recipe with you, to keep it straight and simple. Have some more of the melted cannabutter and sugar for the pan. Preheat your oven to 3500F. Get three mixing bowls, small one and two large ones. Put some warm water in the small bowl, dissolve your yeast in it and set it aside. Grease a large bowl and also set it aside. Mix milk, sugar, salt, egg, and cannabutter in the other large bowl. Add 2 cups of flour and mix thoroughly till it becomes smooth. Add the yeast mixture and mix in the remaining flour until dough becomes easy to handle. For about 10 minutes, work the dough on a lightly floured surface. Place in the greased bowl and cover it till it doubles in size. The approximate time for dough to reach that swell size is 1 to 1 ½ hours. After dough has reached double size, punch it down and roll out on a flour-filmed surface into a 15 x 9 inch rectangle. Spread melted cannabutter over all surface area of dough. Keep in mind that the more cannabutter you use, the better it gets. Sprinkle mixed sugar and cinnamon all over the dough. You can also shower raisins, chopped walnut, or pecans. Remember I mentioned these as just options. Personally, I use raisins. Start to roll up dough from the 15-inch side and pinch both edges together to seal it. Cut dough into 10 to 12 rolls. Coat the inside of your baking pan with cannabutter and shake sugar all over it. In a compact manner, place cinnamons rolls in the baking pan and leave to swell for about 40 to 45 minutes. Bake for about 30 minutes or until desired browning of dough is achieved. Remove from oven and set aside. Make a fresh mix of cannabutter, vanilla, and powdered sugar, adding hot water one tablespoon at a time until the glaze achieves the desired effect. Spread the mixture over slightly cooled cinnamon rolls. 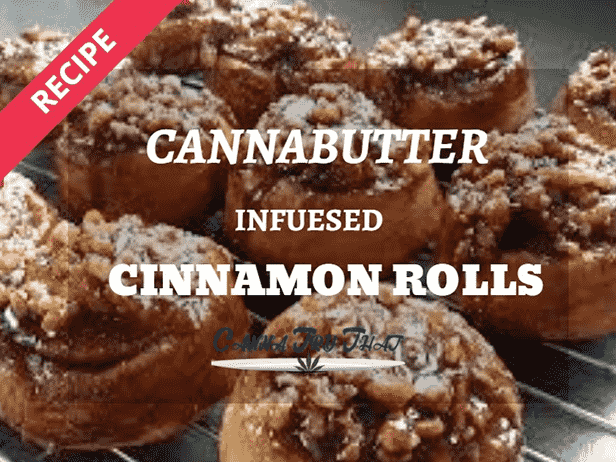 Enjoy your Cannabutter infused cinnamon rolls!